The Kowa YF 6x30 Porro Prism Binoculars were designed to be usable by 4-year-olds, but can be enjoyed by the entire family. The combination of low power, large exit pupil, light weight, short minimum interpupillary distance, and easy focusing make these great for young birders. All lenses and prisms of the YF Series are fully multi-coated. Even though costs were reduced through simultaneous product development, the superior optical performance was maintained without sacrificing important features like being waterproof and dry nitrogen gas filled.  Kowa excellent maintenance "KR Coating"
Power x Obj. Dia.- 6x30, Field of View - 420 ft. at 1000 yds., Exit Pupil - 5 mm, Eye Relief - 20 mm, Dimensions - 6.3 x 4.5 x 1.9 in., Close Focus - 16.4 ft., Weight - 16.5 oz., Weatherproofing - Waterproof/Nitrogen Purged, Prism Material - BaK-4, Coatings - Fully Multi-coated, Armoring - Rubber, Eye Cups - Twist-up, Design Type - Porro Prism. The Kowa YF 8x30 Porro Prism Binoculars were designed to be usable by 4-year-olds, but can be enjoyed by the entire family. Power x Obj. Dia.- 8x30, Field of View - 393 ft. at 1000 yds., Exit Pupil - 3.8 mm, Eye Relief - 16 mm, Dimensions - 6.3 x 4.5 x 1.9 in., Close Focus - 16.4 ft., Weight - 16.7 oz., Weatherproofing - Waterproof/Nitrogen Purged, Prism Material - BaK-4, Coatings - Fully Multi-coated, Armoring - Rubber, Eye Cups - Twist-up, Design Type - Porro Prism. 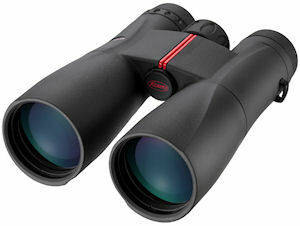 The Kowa SV 8x32 Roof Prism Binoculars lenses are fully multi-coated. The roof prisms are phase coated and have a highly reflective coating that minimizes the loss of light and produces a clear visual range and sharp image. Power x Obj. Dia.- 8x32, Field of View - 408 ft. at 1000 yds., Exit Pupil - 4 mm, Eye Relief - 15.5 mm, Dimensions - 5.4 x 5.0 x 2.0 in., Close Focus - 6.5 ft., Weight - 19.9 oz., Weatherproofing - Waterproof/Nitrogen Purged, Prism Material - BaK-4, Coatings - Fully Multi-coated, Armoring - Rubber, Eye Cups - Twist-up, Design Type - Roof Prism. The Kowa SV 10x32 Roof Prism Binoculars lenses are fully multi-coated. The roof prisms are phase coated and have a highly reflective coating that minimizes the loss of light and produces a clear visual range and sharp image. Power x Obj. Dia.- 10x32, Field of View - 315 ft. at 1000 yds., Exit Pupil - 3.2 mm, Eye Relief - 16 mm, Dimensions - 5.4 x 5.0 x 2.0 in., Close Focus - 6.5 ft., Weight - 20.19 oz., Weatherproofing - Waterproof/Nitrogen Purged, Prism Material - BaK-4, Coatings - Fully Multi-coated, Armoring - Rubber, Eye Cups - Twist-up, Design Type - Roof Prism. 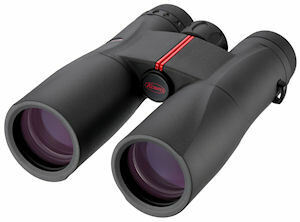 The Kowa SV 8x42 Roof Prism Binoculars lenses are fully multi-coated. The roof prisms are phase coated and have a highly reflective coating that minimizes the loss of light and produces a clear visual range and sharp image. Power x Obj. Dia.- 8x42, Field of View - 330 ft. at 1000 yds., Exit Pupil - 5.3 mm, Eye Relief - 19.5 mm, Dimensions - 6.9 x 5.25 x 2.4 in., Close Focus - 13 ft., Weight - 23.5 oz., Weatherproofing - Waterproof/Nitrogen Purged, Prism Material - BaK-4, Coatings - Fully Multi-coated, Armoring - Rubber, Eye Cups - Twist-up, Design Type - Roof Prism. 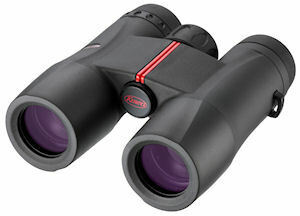 The Kowa SV 10x42 Roof Prism Binoculars lenses are fully multi-coated. The roof prisms are phase coated and have a highly reflective coating that minimizes the loss of light and produces a clear visual range and sharp image. Power x Obj. Dia.- 10x42, Field of View - 315 ft. at 1000 yds., Exit Pupil - 4.2 mm, Eye Relief - 15.5 mm, Dimensions - 6.8 x 5.5 x 2.2 in.., Close Focus - 13 ft., Weight - 23.6 oz., Weatherproofing - Waterproof/Nitrogen Purged, Prism Material - BaK-4, Coatings - Fully Multi-coated, Armoring - Rubber, Eye Cups - Twist-up, Design Type - Roof Prism. The Kowa SV 10x50 Roof Prism Binoculars lenses are fully multi-coated. The roof prisms are phase coated and have a highly reflective coating that minimizes the loss of light and produces a clear visual range and sharp image. Even though costs were reduced through simultaneous product development , the superior optical performance was maintained without sacrificing important features like being waterproof and dry nitrogen gas filled. The lightweight design of the SV 10x50 binoculars, which at 26.1 oz. matches many 42mm binoculars, allows for extended use in the field. Power x Obj. Dia.- 10x50, Field of View - 261 ft. at 1000 yds., Exit Pupil - 5 mm, Eye Relief - 19.5 mm, Dimensions - 7 x 5.25 x 2.4 in., Close Focus - 18 ft., Weight - 26.1 oz., Weatherproofing - Waterproof/Nitrogen Purged, Prism Material - BaK-4, Coatings - Fully Multi-coated, Armoring - Rubber, Eye Cups - Twist-up, Design Type - Roof Prism. 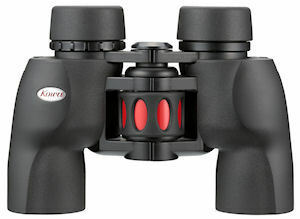 The Kowa SV 12x50 Roof Prism Binoculars lenses are fully multi-coated. The roof prisms are phase coated and have a highly reflective coating that minimizes the loss of light and produces a clear visual range and sharp image. Even though costs were reduced through simultaneous product development , the superior optical performance was maintained without sacrificing important features like being waterproof and dry nitrogen gas filled. The lightweight design of the SV 12x50 binoculars, which at 26.3 oz. matches many 42mm binoculars, allows for extended use in the field. Power x Obj. Dia.- 12x50, Field of View - 252 ft. at 1000 yds., Exit Pupil - 4.2 mm, Eye Relief - 15.5 mm, Dimensions - 6.9 x 5.25 x 2.4 in., Close Focus - 18 ft., Weight - 26.3 oz., Weatherproofing - Waterproof/Nitrogen Purged, Prism Material - BaK-4, Coatings - Fully Multi-coated, Armoring - Rubber, Eye Cups - Twist-up, Design Type - Roof Prism.